When you finally do overcome emotional eating, I have no doubt it will change your life more profoundly than you could ever expect, so I really want to help you get there. In order to do this, I have to EMPOWER you to deal with the hard stuff – the stuff we don’t acknowledge very often – so you know exactly what it will take to get to the other side. Below are the 5 common barriers clients experience on their journey to freedom from emotional eating, and what you can do to transcend them. When greeted with “Hey, how are you?” have you ever responded “Good, thanks”… when you’re totally not? We do it all the time! * But not only do we dismiss our emotions to others – we deny them to ourselves too. We tell ourselves not to be silly, that other people are worse off than us, or that they will go away if we ignore them. And why would we deal with all of those nasty unpleasant feelings when we can just smother them with food? Solution: The answer is, of course, to tune in to your emotions. To learn to listen to them, understand what they are saying, and respond to them appropriately. Your emotions are not to be ashamed of, but to honour. If you listen they will provide you with rich information you can use to make your life better in ways you never thought possible. For my favourite way to tune in to your feelings, see my last article. Often we experience a combination of emotions at the same time, which can make identifying them all hard. For example, we may experience a blend of sadness and loneliness, rather than just one or the other. To further complicate matters, often we feel competing emotions at the same time, like when we experience nervousness and excitement together. The multitude of emotions can make noticing them all tricky, but unless we acknowledge all of our feelings, we won’t have a complete ability to deal with them. Solution: As a simple way to get in touch with the variety of emotions you are feeling, complete the following feeling clusters journal daily for a few days to a week. Just sit down, take a few breaths, scan your mind and body, and circle all the feelings that are going on for you at the time. ** While it may be tricky to identify the emotions, they are there if you look, and this is an easy way to shine the spotlight on them. Because you have become used to soothing your emotions with food, you’re often at a loss for what to do instead. Even if you come up with something (or someone comes up with it for you) you often don’t feel like the alternative will “cut it”. Make important changes in your life. This worksheet helps you identify all of these things, each in a separate column. Let me show you how it works in real time with a real problem! I just got an email where a colleague criticized my work – I’ll do the three columns technique right now and we’ll see what happens. Now, I have done this technique quite a few times, but it honestly took me 5 minutes (and I had to do up the table!) and I honestly feel better. I do this with clients and it takes 10-15 minutes at the start…and over a few weeks it drops down to about 5 for them too! The next time you are struggling with unpleasant feelings (or the eating urges that often accompany them) I implore you to give this a go. You may think you don’t have the time, but what’s more time consuming – ten minutes to sort out what’s going on for you and find a new path forward, or potentially hours or even days grappling with unpleasant feelings, unfulfilled needs, and the frustrating overeating habits that come with them? Let’s face it, even if you have chosen a strategy that NO DOUBT will work better than eating – it will make you feel better, solve the real problem and be a healthier option all round…you probably still won’t want to do it. The challenge in actually doing it exists for a few reasons. First, emotional eating often turns into habitual eating, meaning it’s hard-wired into our brain’s pleasure, reward, and addiction centre. This makes for a powerful neurological resistance to new behaviours, and makes the old habits hard to break out of. Second, eating is often easier. Going to the pantry and picking your favourite snack requires a tenth of the willpower of going for a walk around the block, and one hundredth of the willpower to have a difficult conversation with someone (even though both of these alternatives may serve you much better). Third – the ultimate paradox – when you are emotional your willpower actually decreases, meaning the time you need it most, you have the least…. Solution: At the risk of psychological cliché – this is the part I can’t do for you. Here’s where you need to use your “X Factor” – that part of you that knows you CAN make the right choice for you at the time – and have faith you will feel better afterwards. Don’t expect it to always be easy, prepare for it to be hard at times. Be brave, make space for the growing pains, and muster whatever willpower you have***. This part is up to you – and it’s a decision you will need to make over and over until the alternatives eventually become your new habits. Diet culture permeates our psyche with quick fixes, magic pills, and silver bullets. Even if we consciously know this to be hogwash, part of our subconscious still expects miracle cures to our long-standing problems. So when the dog dies and emotional eating alternatives don’t suddenly make us feel like we’ve just won the lotto, we feel ripped off. The unfortunate reality we need to face is that self-soothing doesn’t always make you feel better. Solution: Let’s be honest. Sometimes you will try the new alternatives and you will feel GREAT! Other times you will just feel less bad. While this won’t make you jump for joy, lessening unpleasant feelings is still a big win. Other times still, you will feel just as bad. While it may seem like the alternative is not working, what you’ll find is underneath the unpleasant feelings, you be relieved you have not turned to food, and proud that you have prevented a potential spiral. Think of it like when you were a kid and you fell over and hurt yourself – someone coming and giving you a cuddle didn’t actually help the sore part feel any better, it just cared for you in your moment of suffering until the pain passed. Understanding that positive self-soothing is valuable no matter how it makes you feel is key to achieving true freedom from emotional eating. After reading these solutions maybe you feel empowered to take on your emotional eating habits starting right now… or maybe seeing all of the barriers made you feel worse than when you started reading… and you want to head to the fridge for comfort. Either way, now your eyes are open wider, you are better prepared than ever to overcome this exhausting and tiresome habit. My only hope is that you begin to use what you have learned, and that part is up to you. 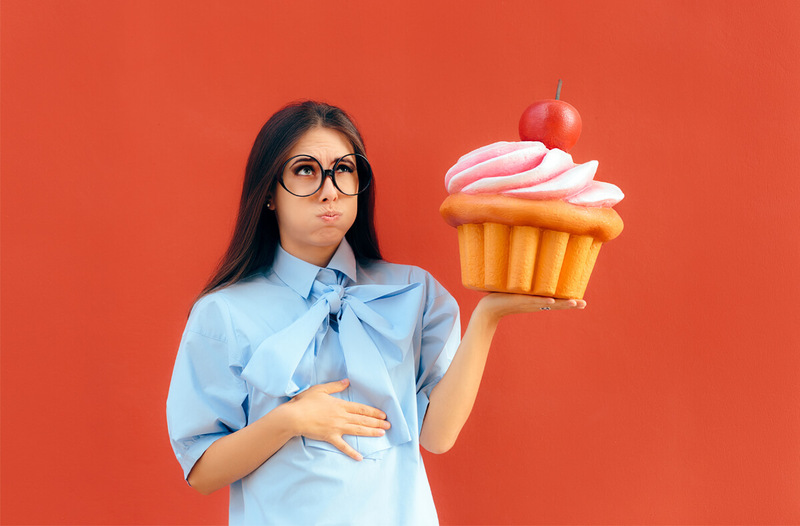 In my last blog, I told you that emotional eating could be a great gift, and change your life in ways you never expected. In this article I’ve shown the price of attaining that gift. My biggest wish is that you begin the journey and find out the benefits for yourself. Find out more about our Freedom from Emotional Eating Online Program. *In fact, if you want to freak people out – tell them how you are really feeling when they ask you. I do this in my apartment lift and it makes for all sorts of interesting conversations! **This journal only includes unpleasant feelings, as emotional eating is defined as “An increase in food intake in response to negative feelings”. The worksheet is designed to help you develop the emotional intuition required for overcoming emotional eating. ***If you want to know more about willpower, emotions, and bridging the gap between your intentions and actions, see Thursday Therapy 29 – “I know what to do I just can’t do it! Hey Buddy!, I found this information for you: "Why it’s so damn hard to stop emotionally eating (and what to do about it!)". Here is the website link: https://www.weightmanagementpsychology.com.au/thought-44-why-its-so-damn-hard-to-stop-emotionally-eating/. Thank you.